How do you get your work done? We win grants from major organisations, such as Melbourne Water, Mornington Peninsula shire, Department of Environment, Land, Water and Planning and Catchment Management Associations which is used to hire contractors to do the major work. We offer matching volunteer hours to assist this process eg after major trees are removed, we plant a wide variety of smaller indigenous plants and undertake maintenance weeding for years to rehabilitate areas. How much money do you raise, who from and where does it go? Recently, we have been raising over $100,000 per annum. This comes from our regular providers (Melbourne Water, MPS, Catchment Management Associations) as well as philanthropic trusts, Business Partners, member donations and member subscriptions. Money raised in grants is mainly for on-ground work and is spent as requested. All grants are audited and all money on grants is spent. Donations can be tied to specific projects or offered for general use. Most donations have been for on-ground work. In dollars we spend less than 5% of total income on administrative costs. In addition, we give around 4-5,000 hours of time as Active Volunteers (valued $30/hr that is worth around $120-150,000). We are amazingly efficient with our administrative expenditure! Do I have to be a volunteer to be a member? No! By just joining us, you are demonstrating your support for what we do. Around 25% of members currently actively assist us by providing us with some time as well as their membership fee. Much of our direct work has been on-ground weeding and planting. This is mostly unskilled and training is always given before the start of any working bee. Anyone who is physically able can do it! Increasingly, we have people involved in communicating with the local community, helping us social media and IT processes, writing and photographing, speaking and lobbying organisations to take actions to support our causes. We are not a political organisation and we are not aligned to, or connected to, any political or even environmental peak bodies. However, we do try to work with government officials and organisations that might help us to achieve our aims. We try to get the ‘right’ things done, using evidence-based, rational, scientific approaches wherever possible. What are your main achievements over the 21 years? 1997: Formed March. First Sunday monthly working bee June. ‘The Creek’ begins. Mornington Peninsula Youth Enterprises begins to germinate local seed for us. 1998: First grants received for water monitoring kit, bank erosion restoration and weed eradication. Tuesday working bee begins. First controlled burn prepared (Bunyip area). Daly’s Dell morning tea spot created. 1999: Balcombe Estuary land management plan completed (with Shire). Waterwatch begins. Environment Week contribution begins. 2000: Gross Pollutant Traps installed by Shire in Mirang Ave and Ferrero Reserve. Soccer pitch project begins (with Rotary). Weedbuster Weeks begin (with Sunshine Reserve). Clean Up Australia Day begins. 2001: Completion of the Centenary of Federation transformation of the campground and carpark (with Rotary). Schools programs begin. Green Corps programs begin. Development of housing on Augusta St opposed. 2002: Flora survey and management plan formed (with Gidga Walker). Harrap Creek group formed. 2003: First annual planning meeting held (with Shire). Website begins. 2004: Bat boxes installed. Envirokit folder produced. Kotor friends group formed. Century Drive Habitat Link group formed. 2005: First burn occurs (Bunyip area). Two more Gross Pollutant Traps installed in Henley Ave and Latrobe Drive. Hopetoun Creek-Greenfield Reserve group formed. 2006: Pumphouse murals created. Working with Deakin University begins. Devilbend Foundation formed. 2007: Second burn occurs ((Rabbit Paddock). Christmas thank you dinners begin. Balcombe Creek Mooruduc Plains group formed. 2010: Banksia restoration project begins. 2011: Friday working bee begins. 2012 Boneseed clumps cleared. Estuary Watch begins. Community Awareness Group formed. 2013: New name and new logo created. Third burn occurs (Maude St area). Sedimentation Action Group formed. 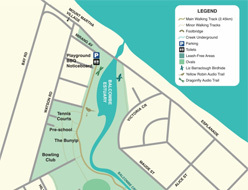 Yellow Robin Audio Trail launched (with Melbourne Water). 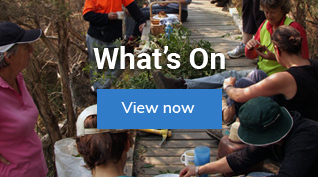 2014: Liz Barraclough Bird Hide completed (with Bunnings, Melbourne Water and the Shire). Birds of the Balcombe Reserves brochure completed. Family Day run. Green Army projects begin. Quarterly CAG functions begin. 2015: OAM achieved for Liz. Traders program begun. Dragonfly Audio Trail completed. Rotunda murals completed. ‘Up the Creek’ history launched. Mary Stemp seat unveiled (with Shire). 2016: Coastal Group started. Measuring Our Progress on ground bushland survey completed. 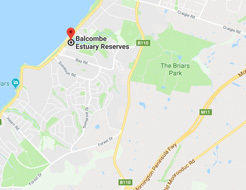 Sedimentation Action Group agrees plan with Shire. Philanthropy Group starts and succeeds in raising $100K for restoration of the North Bank/Maude St reserves. Keith Wilson seat launched. We achieve 100 Active Volunteers. 2017: Environmental Significance Overlay process for whole reserves agreed with Shire, which agreed to fund it. Total revamp of website, grant management, membership and financial systems processes begun. Significant new types of grants found for coast, signage, upgrading reserves. 2018: New strategic plan widened our vision to cover all natural environment in Mt Martha and also environmental issues related to the Creek. Terry Denton appointed as Patron. Business Partners program launched.